President Barack Obama puts his hand on the shoulder of Japanese Prime Minister Shinzo Abe after laying a wreath at the Hiroshima Peace Memorial Park in May. JAPAN'S PRIME MINISTER Shinzo Abe, accompanied by President Obama, will visit Pearl Harbor next week, where he will pay tribute to the 2,000 Americans killed in the attack 75 years ago that propelled the United States into World War II. Beyond that, the two leaders will celebrate a Japanese-American friendship that has become, in Abe's words, "an alliance of hope" that "will not change." The US-Japanese relationship today is indeed a pillar of stability and trust. Yet within living memory, the people of Japan and the United States despised each other. From a 1943 film produced by the Navy, American viewers learned that the Japanese were by nature brutal totalitarians, with no qualms about "wreaking pitiless destruction on . . . helpless people" and "slaughtering all those who stand in Japan's way." The film — "Our Enemy, the Japanese" — was narrated by the distinguished American diplomat Joseph Clark Grew, a Bostonian who twice served as undersecretary of state. "Against the madness of Japan, nothing less than all our efforts will suffice," explained Grew, who was considered an expert on the Japanese way of life. "This then is the enemy: primitive, murderous, and fanatical." 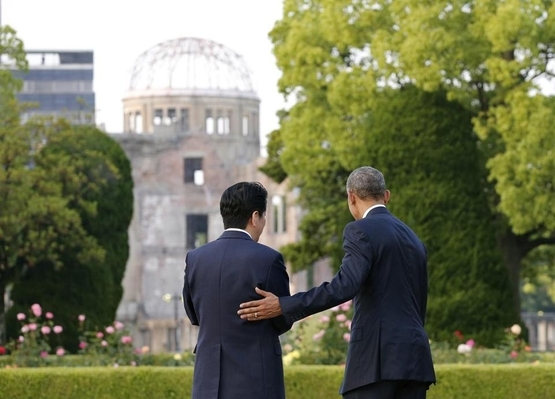 In 2016 we take it for granted that Japan and the United States are friends and allies. A Pearl Harbor attack today is as inconceivable as a Hiroshima bombing; Japan's savage treatment of American POWs could no more be carried out now than could America's appalling internment of Japanese immigrants. It astonishes us today that Americans could have believed in 1943 that the Japanese were irredeemable fanatics whose hostility would be a permanent feature of US foreign relations. By the same token, Americans then would have dismissed out of hand the notion that Japan would become one of our most stalwart, democratic, and peaceable allies. Things change. The forthcoming ceremonies at the USS Arizona, when Abe and Obama will stand side-by-side and extol with perfect sincerity the good will between their nations, offer a timely reminder that in global affairs the bitterest of enemies can become the closest of friends. Sometimes, as with Japan and Germany after 1945, it was a cataclysmic military defeat that paved the way to a lasting and deep-rooted alliance. At other times, mutual exhaustion, the expansion of trade, or the spread of enlightened democratic values have worked an end to bloody enmities that once seemed immutable. The murderous struggle between the English and the French for the throne of France in the Middle Ages lasted so long that it came to be known as the Hundred Years' War. (Actually, it lasted 116 years, from 1337 to 1453.) And the Hundred Years' War was only a subset of a series of Anglo-French wars that stretched across more than six centuries. Today, Britain and France are NATO allies, close trading partners, and mutual tourist destinations; movement between the two countries is robust and unimpeded, with countless travelers crossing the English Channel daily by ferry, rail, and plane. Yet Britain and France were deadly military enemies as recently as the 19th century. Only with the approach of the 20th century did the ancient rancor and mistrust finally give way to an amity that would once have seemed a pipe dream. To us, in 2016, it may seem delusional to imagine a close and trusting alliance between Russia and the United States. It may be impossible to imagine Iran's theocratic rulers replacing their "Death to America" worldview with one of affection and warm cooperation with the West. And as radical Islamists slaughter innocents from Syria to San Bernardino, who would describe as anything but a fantasy the rise of an Islamic enlightenment destined to spread peace, liberty, and tolerance? But such fantasies have sometimes become reality. 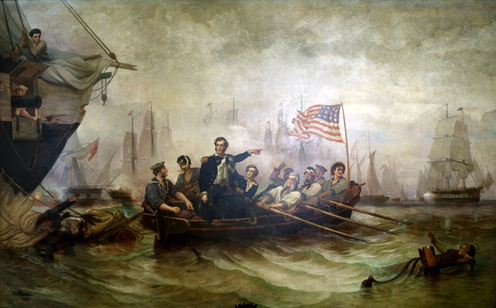 The Battle of Lake Erie, fought off the coast of Ohio on 10 September 1813, was one of the bloodiest naval clashes of the War of 1812. "Chippewa led the enemy line, followed by Barclay's flagship, the Detroit, the brig Queen Charlotte, the brig Hunter of 10 guns, the schooner Lady Prevost, and the sloop Little Belt. [Commodore Oliver Hazard] Perry accordingly arranged his line so that the Lawrence was in the van, with the schooners Ariel and Scorpion standing by her weather bow, the Caledonia next, to fight the Hunter, and then the Niagara." When the fighting erupted — the fighting between Americans and Britons — it was horrible. Scores of seamen on both sides were killed or wounded. Blood, screams, and shattered spars were everywhere. The Battle of Lake Erie was one of many naval encounters in the ferocious War of 1812; today, in many places along the Great Lakes and St. Lawrence River, historical maps and markers explain in great detail the savage warfare once unleashed there. Yet across a border where warships once pummeled each other, there is nothing now little more than a line on a map. The longest boundary between two nations anywhere on earth today are the 5,525 miles that make neighbors of Americans and Canadians. Even the most militarized frontiers can become peaceful. Even implacable enemies can be transformed into friends. To be sure, we live in the present and must contend with the world as it is. But the animus of the present isn't permanent.